First off, Happy New Year readers and fellow bloggers! I hope you all had a safe and enjoyable evening wherever and whatever you were doing! It’s a new year and so of course we are going to see a few New Years Resolution posts on our dashboards and timelines over the next few days. This yer I’ve decided to set myself 14 things that I’d like to achieve in 2014. These I’ve decided will be both blogging and personal goals to make it more exciting for my readers, I hope you find it exciting, and I really hope to achieve them! Some of them are taken from my ‘25 things before 25‘ but hey, there’s nothing wrong with killing two birds with one stone! I’m ready for a motivational and positive year, lets go! Go on holiday 11/2014 Went to Mauritius! Get 400 blog followers on each platform Thank you to my followers! Make more blogging friends Met some fabulous people! Spend less, save more! Saved a lot! Woohoo! Discover more food places and blog about them Eating all the food! Be healthier – eat healthier, tone up, be more positive positive head on, feeling good about everything! So there are my initial 14 things I would love to achieve in 2014. Most of them seem quite easy, the top three will be most time consuming but definitely worth it in the long term. 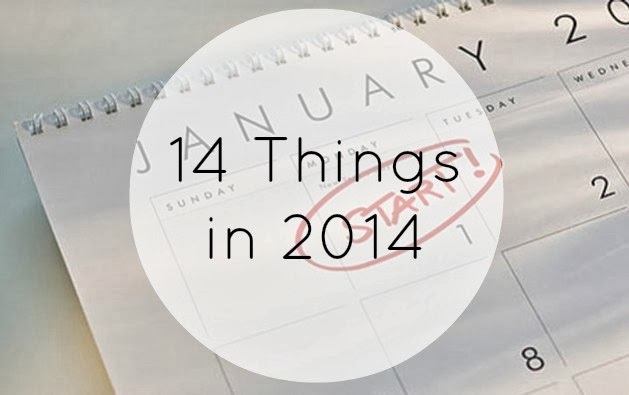 Have you got any New Years Resolutions or have you done a post on what you’d like to achieve in 2014? I’d love to read it and follow you on your journey, leave a comment below to let me know! Maybe this has inspired you to think of your own 14 things you’d like to achieve? Again, let me know!